Matchmaking is better known to players as the "balancer," but this mechanic in War Thunder is called matchmaking for good reason. Unlike simple team selection systems, designed only to balance out the game sessions, the capabilities of War Thunder's system are much broader. It allows you to create sessions with strictly defined vehicles, restrictions on certain types and classes and various other configurations. By Battle Rating – the battle performance rating given to every Aircraft, Ground Vehicle, or Naval Vessel. These ratings may vary across game modes. By Bracket – the same as BR, but grouped into brackets. In accordance with strictly prescribed lists of permitted vehicles with the ability to limit numbers, e.g. in events playing through historical battles, only the vehicles that would have actually participated in the battle are permitted to take part, and the number of individual vehicles can also be limited. Tournament – uses the player’s personal rating to select opponents of equal strength in various competitive events. Learn more about game modes in their respective related articles. In this article, you can find out about the general rules of matchmaking. This is the most widespread matchmaking method. It is used in the two biggest battle modes, Arcade and Realistic battles, involving ground vehicles, aviation, and naval forces. When selecting allies and opponents in these modes, the matchmaking system uses only one parameter – your vehicle Battle Rating. Battle ratings (BR) is given to every vehicle in War Thunder and depending on the game mode, matchmaking uses either the average BR of your vehicle set or the highest BR of any single vehicle from your entire set. For all game modes, the maximum BR range for a session is limited to ±1.0 from the average BR or the BR of the best vehicle in your set. This means that you will never come up against an opponent whose BR is more than 1.0 higher or lower than your average vehicle BR or the BR of your best vehicle. The matchmaker always aims to assemble teams with minimal BR spread, which has a positive impact on gameplay experience. Selection begins by searching for players with the same BR as you and the net gradually widens if a closely rated team cannot be assembled. This means that the more players are queued for battle, the better the balancing will be. These are all the rules governing matchmaking in random battles. There are no exceptions. In Air Arcade mode, matchmaking works differently in comparison with any other mode – it is performed in accordance with the average Battle Rating of several aircraft with the highest BR among all the aircraft in the set. Damaged or temporarily blocked vehicles will not be factored into the calculation, as they cannot be used in battle. Matchmaking by average BR allows players to even make use of the capabilities of planes that are inferior to newer aircraft in the player’s set, as well as to continue to use the tried-and-tested aircraft for a long time. Where A is the vehicle with the highest BR, and B and C are the top-rated vehicles after A. If the difference in rating between vehicle A and vehicle B or C is greater than 0.6 BR, then the rating of the vehicle outside the permitted range will be calculated as A-0.6. If the difference in rating between vehicle A and vehicle B or C is greater than or equal to 2.0 BR, then the rating of the vehicle will be substituted for the BR of the top vehicle (A). If fewer than three crews go into battle, the missing aircraft are given values of A-0.6. The average BR resulting from the calculation is rounded to the nearest number from the range: X.0, X.3, X.7. In borderline cases, the BR is rounded up. So X.15 will be rounded to X.3, X.35 will be rounded to X.3, and X.5 will be rounded up to X.7. Vehicle, with a BR lower than 2.0 from a top BR - goes beyond the permissible BR and its rating is considered equal with the top rated vehicle BR. In all other random battle modes, matchmaking uses the highest Battle Rating of the vehicles available in the player’s set. In Air Realistic mode, matchmaking is performed based on the aircraft selected for the battle. Since the vehicles not selected cannot be used in the battle, there is no need to include them in the calculation. In Ground Forces Arcade mode, matchmaking is performed based on the tank with the highest BR in the set. In Ground Forces Realistic mode, matchmaking is performed based on the tank or aircraft with the highest BR in the entire set (depending on which vehicle has the highest BR). Many players have a preference for several modes. 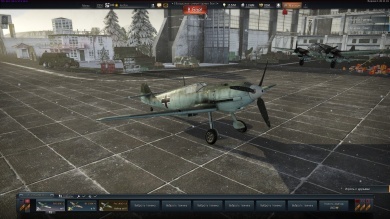 For their convenience, there is a "vehicle preset" mechanism, which allows players to save preferred and frequently used vehicle arrangements in their hangar. This allows players to prepare for any type of battle in just a few clicks. Air Simulator battles use this matchmaking method. When the player opens the Air SB interface, they will see several identical missions where the only difference is the BR of the permitted aircraft. All you have to do is select the desired battle rank and assemble the required aircraft in your set. Very straightforward. This method is used in Ground Forces Simulator battles. When the player opens the Tanks SB interface, the names of the vehicles permitted for the current battle will be clearly displayed. Battles are regularly updated, so the team composition options also change. As an example for this type of battle, let's have a look at the missions from "Events and Tournaments". Matchmaking for this mode is made only from the vehicles that were specially selected for every mission. This type of Matchmaking allows developers to carefully reconstruct historical events from different battlegrounds, while paying attention to power balance. This also aims for the creation alternative history missions and holding events with a number of possible finals. Sessions are made from all vehicles allowed, without looking at BR or vehicle ranks. Teams can have different numbers of players, and that is also controlled in the mission settings. The exact matchmaking settings for every mission can be obtained from the mission descriptions shown in the in-game client for each mission in the "Events and Tournaments" list. All missions in this mode have different difficulty levels and can have a mix of ground and air vehicles. Matchmaking is able to create sessions depending on a player's personal skills level, and that's an important feature of the game. This type of matchmaking fits to 'duel' and 'sparring' forms of battle tournaments and challenges, where personal expertise plays a key role in success. Creating a session based on player personal rankings allows to equalize forces of teams, squadrons, and particular players, and makes sessions more fair and attractive. Rating battles of all types do not have mutual effect, meaning that player rating gained in one mode will not affect other rating battle modes. Player rating can also be reset after a corresponding tournament or event ending. Squadron battles are a subset of rating battles. The key difference here is that matchmaking is made by teammate average scores, taken as the arithmetical mean of all teammate ratings. To participate in this type of battle, one needs to be a part of squadron (clan). These battles are only 8×8 in all game modes. A player's personal rating is calculated from his personal battle results for clan events, and 'only' clan events. The initial player rating is 0. In case of victory, the player's rating is recalculated as if it was 1500, and in case of failure, the player rating changes from that current rating value so that it can be lower than 1500. Map Rotation refers to the chance one has to be placed into a game on one or another location, depending on pre-determined conditions. In War Thunder, there is only one such condition - the rank of your chosen ground vehicles. Suppose you play with the T-26, being a tank of the first rank. In this case, you will only be able to get into battles on locations that are specifically selected for vehicles of the first rank. If your vehicle lineup comprises of vehicles with several different ranks, the rotation of locations will then work pursuant to the highest ranked vehicle within your lineup. Therefore, if your lineup has both the T-26 and T-44, your battles will occur in accordance with the category of locations provided for the vehicles of rank IV. The need for the rotation of maps revolves around map size, as well as gameplay complexity. The bigger (and more difficult) a location is in terms of gameplay, the more experienced should those players which are to battle upon it be. This page was last edited on 28 March 2019, at 13:30.